I have been looking through the past recipes done by the bread baking group We Knead To Bake to do one for February. I also wanted to make a bread to welcome the hubby home - he'd been away for a few days. It's also a working day today so I wanted something quick and easy. The Herb and Cheese Pull Apart bread that they did in January last year fitted the bill perfectly. 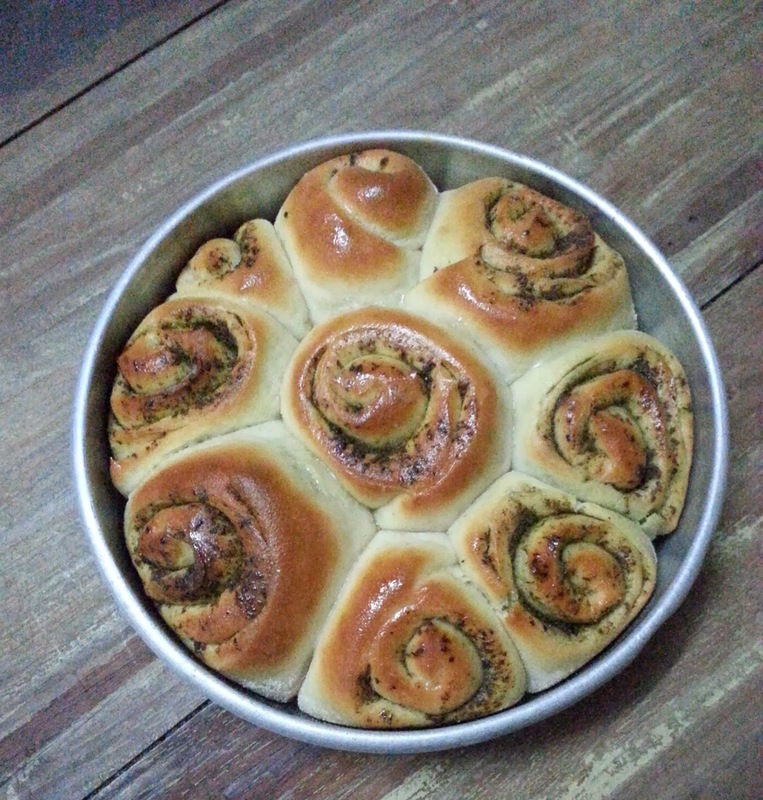 This was the first bread the group did together at the start of WKTB in 2013. 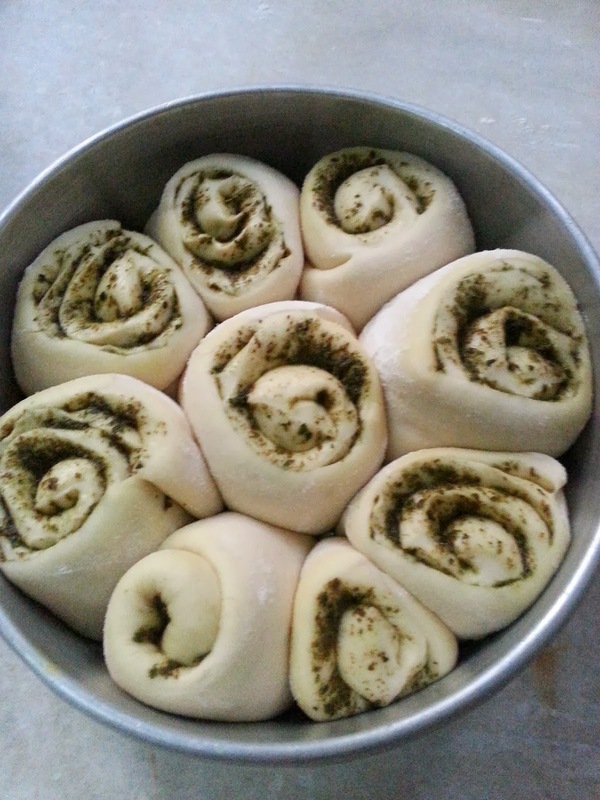 I browsed around to see what the other members had done with this recipe and chose to follow Saee's recipe for Pull Apart Pesto Rolls. I had plenty of pesto in my fridge and this would be a great new way to use up some of it. I'm reproducing Saee's recipe here. I haven't tweaked it at all. In a small bowl or glass mix the yeast and sugar and pour the warm water over. In a separate bowl or directly on your work surface measure out the white flour. Make a well and pour in the yeast sugar mixture and start bringing the dough together with your fingers. It will get sticky but will come together very soon. Knead it on the counter top for a bit. On the side take the 2 tsp of butter and the salt and combine them together making a smearing movement in a tight circle using your fingers parallel to the surface. Once the two are combined and the butter looks light and foamy work it into the dough. Once you add the fat the stickiness of the dough miraculously disappears. Knead the dough well, stretching it as you go, for a good 10 minutes. Roll into a ball and place it in a bowl to raise. Cover with a damp cloth and leave it somewhere warm. It will double in 20 to 25 minutes max. Remove the dough back on to a floured work surface. Punch out the air and knead for a minute. Roll it out into a flat oblong not thinner than 1/4 cm. It doesn't matter if the shape is not perfect. 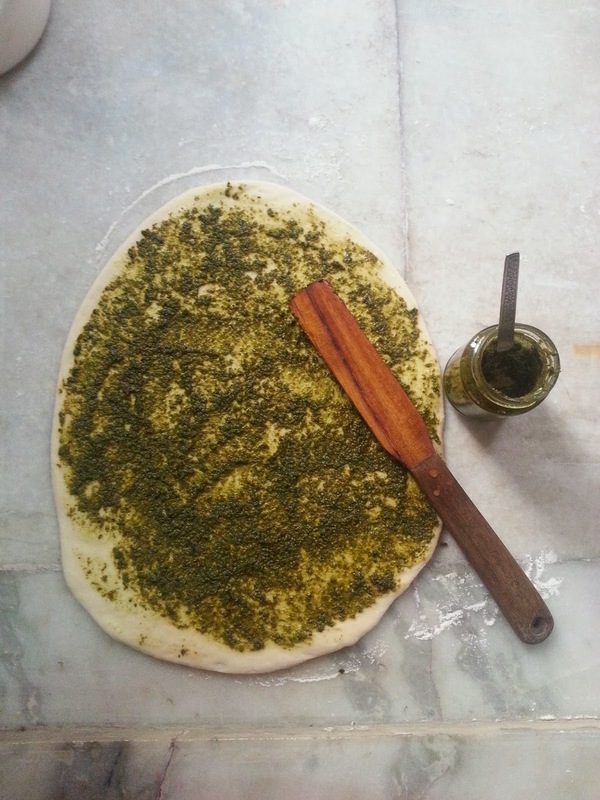 Spread the pesto evenly across the flattened dough going out to the edges. Roll the dough carefully into a log. Cut the log into nine pieces and arrange them in a 9 inch round baking tin. Leave it to rise for another 20 minutes. Remember to leave some space between the rolls so they have room to rise. Once the rolls have doubled and look squashed up next to each other pop them into your oven and bake for 20 minutes at 200C. The tops should be a nice light golden colour. Brush the rolls with butter while they are still warm. Cool completely and they will come out of the tin very easily. The same basic bread recipe can be used with a variety of fillings - Nutella, herbs and cheese, finely diced bacon or ham with cheese... just use your imagination and enjoy yourself! This sounds so easy and looks yummy too. I am a bit wary of baking...too many precise measurements etc. But this one I intend to try out. 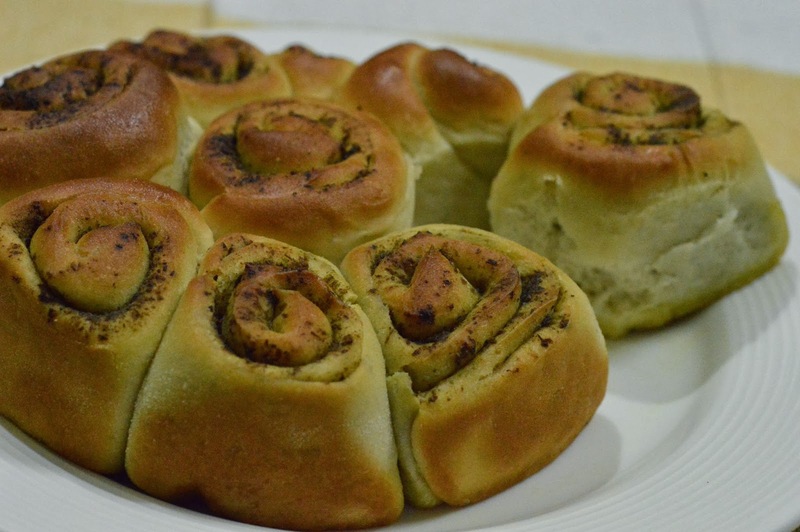 I tried your recipe and it turned out pretty well.although i did somealteration,,i amde in form of rolls with sauted onion and mushroom filling.